The Baysox lovable mascot Louie made visits to schools across the region during the past month to congratulate some very special students. Louie wanted to congratulate the winners of the annual poster contest that kicks off the Read and Hit a Home Run reading program. The students' poster designs were selected as the winner for all schools in their county. The poster designed by the winning student will also be displayed in each participating school in their respective counties throughout the program. 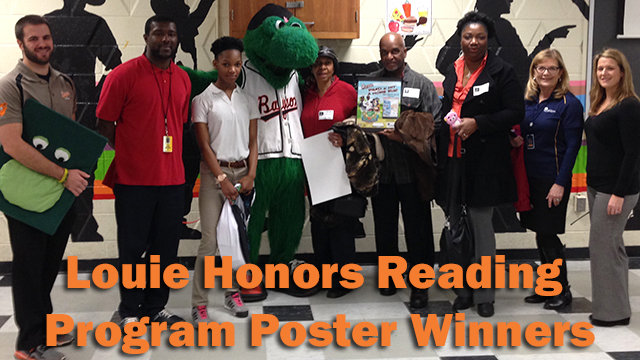 Louie surprised the winners during special school assemblies, rewarding them with a framed poster of the design, eight Baysox tickets and a collection of Baysox gear. The students also get a chance to throw out a ceremonial first pitch before the Baysox Reading Night game for their county. The Baysox would like to thank Read and Hit a Home Run Reading Program sponsor Educational Systems Federal Credit Union for their support of the program. This is the 11th year that Educational Systems Federal Credit Union has sponsored the reading program. In all, more than 200 schools are registered to participate in the reading program this year. Any student in participating schools who reads at least four books is rewarded with a free ticket to a Baysox game. This is the 19th year the Baysox have overseen the reading program and during that time, the team has helped to promote reading for millions of elementary and middle school students in Maryland. Louie will be visiting students throughout the weeks leading up to the season to show them how fun reading can be. Baysox Baseball - We'll Knock Your 'Sox Off. The Baysox open the 2015 season, their 23rd as the class Double-A Affiliate of the Baltimore Orioles, on the road April 9 and play their home opener Thursday, April 16 against the Erie SeaWolves. To keep up with Baysox news during the offseason, visit baysox.com.